Looking for an economical way to investigate multiple targets in cell signaling events? 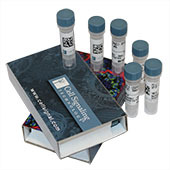 CST™ Antibody Sampler Kits contain sample sizes of several antibodies directed against a protein, pathway or cellular process of interest, as well as secondary antibodies. Each primary antibody in the kit is sufficient to perform four western miniblots per target.